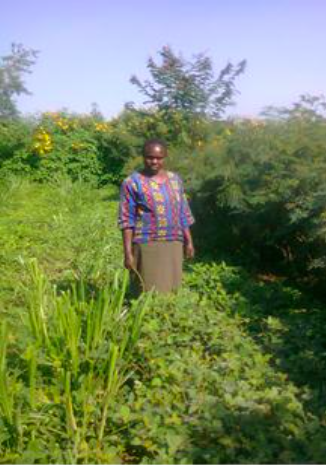 A female farmer admiring her plot of Napier-Desmodium intercrop and Calliandra shrubs on her left-hand side (page 16 of the report). Climate change poses new challenges to the fight against poverty and sustainability of agrarian livelihoods in sub-Saharan Africa. Predictions indicate that climate change will adversely affect agricultural production in sub-Saharan Africa through declining crop yields and livestock productivity caused by rainfall variability, rising temperatures and increased pest/disease incidences. More recent findings confirm that climate change is likely to cause considerable crop yield losses thereby adversely affecting smallholder livelihoods in Africa. As a result, food security and income generation opportunities for the farming households that are most reliant on agriculture may be in jeopardy. The North-western region of Kenya is a major producer of food crops and livestock products in the country. This means that major changes in productivity of key agricultural enterprises from the effects of climate change may lead to far-reaching implications on national food security and farmers’ livelihoods. In Kenya, the MICCA pilot project, which was initiated in September 2011, mainly focussed on smallholder dairy farmers, with the aim of integrating climate-smart practices into the farming system and improving productivity. To achieve this, the MICCA pilot project co- operated with the East African Dairy Development (EADD) project to promote a variety of CSA practices including agroforestry, improved fodder production, tree nurseries, manure management, composting and biogas generation. This study* examines the incentives and constraints to adoption of the promoted climate- smart agricultural practices in Kaptumo, Nandi County of Kenya. Findings and insights from this study provides useful knowledge on the dynamics of adoption of the CSA practices and lessons learnt to further inform extension, projects and up-scaling. The results from this study are valid for the population in the MICCA pilot site and may be generalized to similar areas in Nandi County and other counties in the country, which are characterized by tea- maize-dairy farming system and small land sizes. The study considers wider policy, institutional and social structures and processes that may affect adoption. In addition the assessment also provides farmers’ perceptions on initial benefits of those practices in terms of agricultural production, livelihoods diversification, overall resilience to climatic risks and household food security. *Download the full study from the right-hand column. The MICCA project work in Kaptumo, Nandi County of Kenya was implemented through a system of volunteer farmer trainers and small-scale farmer groups. Dissemination of CSA practices and knowledge in the pilot site applied an innovative farmer-led extension approach that relied on volunteer farmer trainers. During the implementation period of three years, 23 volunteer farmer trainers directly reached about 1500 farmers belonging to 32 farmer groups. These farmer groups were formed as the main training units while volunteer farmer trainers for each group were selected through the Kapcheno dairy. In addition, with the technical support of the MICCA pilot project, 32 group tree nurseries were established with 90, 000 seedlings and 2 biogas digesters were constructed. According to the project staff, the project also organized field days to reach many farmers and learning tours within and outside the county for farmers to exchange ideas on improved farming practices. An updated list of 440 farmers excluding names of close family members to increase variability in the data, was developed with the participation of local key informants. These are members of farmer groups formed by the MICCA pilot project, and thus directly participated in various project activities and trainings. 6) household food security and adoption benefits. A total of 150 homesteads were visited and the household member belonging to a farmer group was interviewed using a structured questionnaire. Data were collected on household size and characteristics; livestock and crop production; participation in EADD- MICCA capacity building activities; adoption of specific CSA practices (including improved fodders, agroforestry practices, tree nursery management, manure composting and biogas use). In addition, information was collected on adoption constraints and perceptions on early benefits from the CSA practices adopted. Homogenous groups of stakeholders that had actively participated in the project activities or interacted with farmers in the six locations of Kaptumo Division were constituted separately and guided through focussed discussions. Most of the households were male-headed (71 percent) while female-headed households constituted 29 percent of the sample. Majority of the farmers who participated in MICCA pilot project activities were male (65 percent) while 35 percent of them were female. A majority (90 percent) of farmers in the project group were household heads, which implies that they also made decisions on farming activities. About 45 percent of the farmers had attained secondary level of education, followed by 33 percent with primary and 15 percent with college education. A similar trend was found across gender with 47 percent of male and 42 percent of female famers having attained secondary education. This indicates that a majority of farmers have appreciable formal knowledge to understand and implement climate-smart agricultural technologies promoted in the area. At least a third of all farmers mainly sold milk to generate household income. This finding clearly shows that improvement of milk production and marketing as envisaged by the EADD-MICCA pilot project can benefit most farmers thereby narrowing gender disparity based on income. A high proportion (71 percent) of male farmers used motorbikes compared to about 58 percent of female farmers. This is perhaps due to the fact that taking farm produce to the market is mostly done by men. About 15 percent of farmers used public transport mostly among female farmers (25 percent). Farmers who relied on public transportation incurred slightly higher cost and took more time (37 minutes) to reach the market compared to those who used motorbikes. About 45 percent of the farmers obtained agricultural credit from various sources (Figure 3.1). Access to credit for farming purposes did not significantly differ between male-headed and female-headed households. Generally, most of the loans received were used for purposes aimed at improving farm production such as purchase of farm inputs (40 percent), purchase of livestock (21 percent) and purchase of land (16 percent). More male-headed than female-headed households purchased farm inputs (e.g. seeds, fertilizers, mineral licks etc.) with loan amount. Conversely, higher percentage of female- headed than male-headed households bought livestock using the loan money. This finding indicates that male farmers are already advantaged in terms of livestock ownership and would simply purchase variable farm inputs unlike their female counterparts. According to the household survey, the average farm size was 4.1 acres and disaggregated by gender, male-headed households owned 4.4 acres and female-headed households managed 3.6 acres. This finding points to small average land holdings that may require the application of intensive and sustainable practices in order to support the increasing needs of farming households with rising population. Overall, half of the household members supplied family labour to their own farms and this proportion was higher among female-headed households. About 55 percent of the sampled households hired on average three labourers to supplement family labour for half a year. Male-headed households hired slightly more workers but for a relatively short period compared to the female-headed households. The average daily milk output, sales, prices and revenue were comparatively higher during the wet season than the dry season, irrespective of the type of cattle breed (i.e. local or improved). This is likely to be due to the greater feed availability during the wet season. This finding shows that there is a potential for climate-smart practices such as improved fodder production and effective feed conservation to help even out milk production between the two seasons. Most farmers were trained in improved fodder production (70 percent), better livestock management (68 percent), feed conservation and utilization (65 percent) and tree planting (65 percent). High participation of farmers in training aimed at improving livestock productivity indicates a growing interest to increase milk output and income, which is likely related to reducing revenues from tea sales. More than half of farmers participated in capacity building activities related to environmental conservation and mitigation of climate change such as awareness campaigns on climate change, establishment of tree nurseries and tree planting. About 54 percent of farmers were trained in group dynamics, which according to project staff, was in recognition that more farmers needed collective action to adopt most of the CSA practices so as to achieve discernible impact on agricultural production in the face of climate change and enhance resilience of rural livelihoods. Low participation in training particularly on manure management, compositing and biogas digesters may affect actual adoption of these practices. Table 3-8 (page 15 of the report) presents which information was the most important for farmers on the access to various improved agricultural practices through the MICCA pilot project capacity building activities. Nine in every ten farmers reported to have planted some fodder crop on their farms. This proportion provided overall incidence of adoption of improved fodder crops. Improved fodder cultivation was reported in more male-headed (92 percent) than female-headed (82 percent) households. This could be related to the comparatively smaller average farm sizes within female-headed households as well as the property deed belonging to male that likely constrained planting of fodder crops. Farmers considered several key criteria when they chose the type of fodder crops to adopt on their farms. The most important criteria included more milk production (84 percent) when an animal is fed on a particular fodder, high herbage yield (60 percent), easy to harvest and feed to animals (49 percent) and faster growth (46 percent). Feed conservation is useful in ensuring that livestock feed is available during both dry and wet seasons to stabilize milk productivity. However, more than half of the interviewed farmers did not practice any feed conservation. Almost all (93 percent) of the homesteads had some of the promoted trees. A larger share of male-headed (94 percent) than female-headed (89 percent) had planted trees on their farms possibly due socio-cultural factors such as land tenure and customs that may limit women from planting trees. Farmers considered five main criteria when choosing suitable agroforestry and fodder trees to plant. The main factors were the number of uses, period to maturity and availability of seedlings, from more to less important. Farmers were likely to plant trees with a multiple use, with a faster maturity, and whose seedlings were readily available in the area. Other factors, less important but preferred by female famers, were tolerance to dry spells and better income prospects from the sale of the trees and their products. About 41 percent of the farmers had established their own or group tree nurseries. The main challenges were unreliable rainfall (63 percent), damage by pests and diseases (63 percent) and unavailability of preferred seeds (60 percent). The majority of farmers (88 percent) collected livestock manure in the last 12 months. Most of the farmers typically store manure both under shade or simply uncovered in the open. These common management practices do not minimize GHG emissions. Only about 10 percent of farmers practised composting or manure protected with polythene covers as promoted by the project to mitigate climate change. Results show significant relationships among the adopted CSA practices. For example, the adoption of Rhodes grass was found to have positive and significant associations with the adoption of Napier grass, fodder sorghum, Lucerne, Desmodium, Calliandra, and biogas digester. This implies that farmers who adopted Rhodes grass were also likely to implement the other CSA practices to supplement livestock feeding and use manure in biogas digesters. This finding indicates the existence of important synergistic relationships that could be harnessed to achieve a wide scale uptake of CSA practices in the area. Results show that the adoption of CSA practices had significant associations with varied socio-economic factors. For instance, adoption of Napier grass was associated with secure land ownership (with title deed) and hired labour for relatively longer periods. Adoption of Rhodes grass tended to increase among farmers who managed relatively large farms, hired labour, obtained agricultural credit and owned more cattle. Interestingly, adoption of fodder trees such as Calliandra and Leucaena was associated with comparatively younger farmers as indicated by the negative correlations with farmer’s age. Participation in MICCA capacity-building activities had positive relationships with most of the adopted CSA practices. Key barriers to adoption of improved fodder crops are provided in Table 3-19 (page 31 of the report). Majority of the farmers who did not have tree nurseries cited factors presented in table 3-19 (page 32 of the report). The main factors that limited the adoption of digesters for biogas generation were lack of initial capital for construction of the units (58 percent), lack of knowledge on biogas installation (30 percent) and limited manure quantity (12 percent). Overall, about a third of all farmers saw a “lot” of contribution and another one-third perceived “somewhat” of a contribution to household food availability and income. There were very few of them who perceived no contribution of CSA practices to household food availability and income. Disaggregated by gender, a higher fraction of female headed than male headed households felt that implementation of CSA practices has so far little or no contribution to improve their households’ food security situation. The main benefits identified by the adopters were improved farm income (24 percent), increased time availability for non-farm activities (16 percent), reduced labour demand and contribution to better environment (14 percent each). Overall, just one in every ten farmers have realized increased crop productivity and improved household food security. These benefits were largely derived from the adoption of CSA practices on agroforestry (33 percent), improved fodder production (29 percent) and better dairy herd management (16 percent). According to participants in focus group discussions, considerable gains are yet to be realized by a majority of them in terms of improved milk quality and availability of fuel wood from some of the promoted CSA practices. Key among the necessary incentives, cutting across the five main CSA practices, included continued assistance from the project (25 percent), more training and demonstrations on selected improved practices (23 percent), good examples set by frontrunners (15 percent) and access to affordable credit (12 percent). Access to planting materials or seeds could enhance the adoption of agroforestry (43 percent) and improved fodder production (29 percent) practices. Findings clearly revealed the most adopted CSA practices as improved fodder production (i.e. Napier and Rhodes grasses) and planting of agroforestry trees (i.e. Grevillia and Croton). Whereas the least adopted improved practices included establishment of tree nurseries, fodder trees, manure composting and installation of biogas digesters. Some of the important lessons learnt from implementation of this project include the need for wider stakeholders’ consultations during project inception, instituting an effective collaboration platform to harness synergy from other partners, continuous involvement of local leadership to enhance project ownership and integration of a simple reward mechanism to motivate project participants (i.e. farmers and trainers) who perform well. However, to ensure that many farmers are empowered to benefit more from the improved agricultural practices, this study recommends that the EADD and/or the county government extension continue the work in those locations of the pilot site that are yet to be reached. This could be achieved by increasing and motivating farmer trainers to train more groups, supporting them with seeds to establish demonstration plots in their farms and organizing for additional field days and learning tours for farmer groups to build their capacity on CSA practices. To overcome some of the financial constraints to adoption of CSA practices at the local level, as suggested by farmers themselves, there is a need for them to embrace collective action to mobilize resources through table banking, merry-go-rounds, cost-sharing and group credit access. Deliberate arrangements are required to support farmer-to-farmer dissemination of promising improved practices. A reward mechanism requiring that non-participating farmers be periodically allowed to visit model farms maintained by participating farmers, will ensure that those farmers who are not necessarily in groups are also adopting climate-smart agricultural practices. Mutoko, M.C., Rioux, J., and Kirui, J., 2015. Barriers, incentives and benefits in the adoption of climate-smart agricultureLessons from the MICCA pilot project in Kenya. Food and Agriculture Organisation of the United Nations. EX-ACT Tool: How can we assess the mitigation potential of agriculture and forestry development projects?